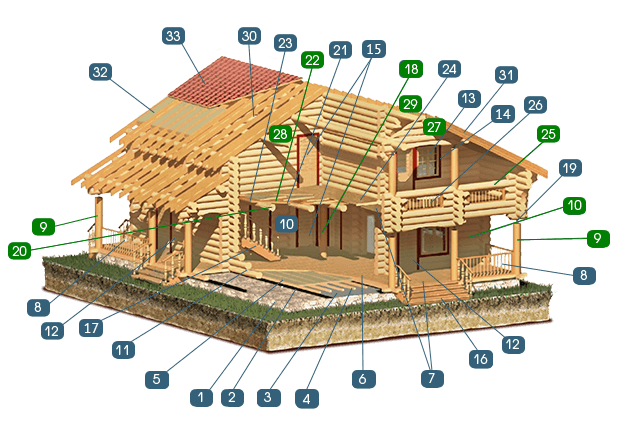 If you want to calculate the cost of log shell, you should multiply the area of the house indicated in designs by 200 euro. Thus, you will get the cost of round-edge cant log shell (thickness 21 cm) or round log shell (log diameter 26-30 cm). To get the cost of assembly works on your foundation, multiply the same area by 2 500 rubles. Final price of the log shell depends on the wall height, the number of inner walls, diameter and tree kind. We will try to satisfy your demands depending on your requests and finances. You can order the log shell in simple or extended set and it will not impact the quality of the house. If you want the cheapest log shell, get the house of damp logs with diameter 26-30 cm without inner walls, 2 meters high. Such log shell will cost approximately 6000 rubles per square meter. Though we build turn-key ready houses, you can still order only log shell and do all interior works yourself. -Cost of automatic crane within unloading and assembly of the logs. -Checking the geometry and assembly of the first row of four logs. -Installation of ledger strips into window and door openings.